‘There’s something about an unamplified voice on stage that is so raw and so human that you turn your head to look at it,’ says Australian tenor and Jette Parker Young Artist Samuel Sakker. ‘It’s been around for 400 years, so there’s obviously something in it that speaks to an audience. Opera gives people a chance to put down their phone and experience something really human’. The Sydney-born singer certainly had his head turned by the art form – ‘I’d always been a singer’, he says, ‘but at school I was the bad chorister because my voice didn’t blend. I was told my voice stood out and was “ugly” – a choir demands homogeny, but in opera it’s more about individual voices coming together’. ‘Opera is hard to break into in Australia - you’re stuck in a vicious cycle where you can’t get a job unless you’ve had a job'. As a result, he put singing to the side and devoted his energies to studying commerce. However, after success in a singing competition and urging from his coach, Samuel applied to audition for the Jette Parker Young Artists Programme. The Jette Parker Young Artists Programme is designed to support the artistic development of talented singers at the beginning of their career. During a two-year period as salaried members of The Royal Opera, singers undertake daily coaching in languages, stagecraft and vocal techniques. They also cover roles, and perform in concerts and in smaller roles on the Covent Garden main stage. ‘I love it here. It’s the nicest environment I’ve ever worked in’, says Samuel. ‘Everyone is at the top of the game which means people aren’t insecure about their place’. ‘Usually we only sing the small roles and while this is amazing, it can be quite limiting because you don’t really get to show what you can do. This was my opportunity to sing something big, brash and loud which is what I am, most of the time – not just on stage’. The tenor was a last-minute replacement for Rolando Villazón in the recent performance of Mozart's Requiem in Tokyo on The Royal Opera's Japan tour. 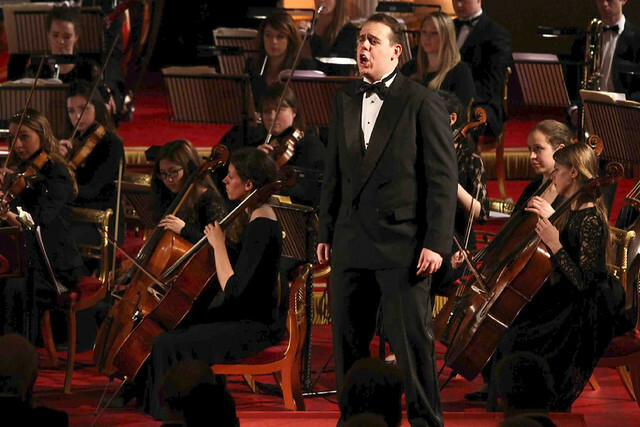 Singing alongside Joyce DiDonato, Ildebrando D'Arcangelo and Albina Shagimuratova – and conducted by Antonio Pappano – Samuel describes the experience as ‘both terrifying and exciting – the sort of moment when your training, skills and intuition carry you through the adrenaline tsunami’. Samuel’s next challenge is performing the roles of First Officer / Sandy in Peter Maxwell Davies’s The Lighthouse. The opera will be performed in the Linbury Studio Theatre as the centrepiece of Meet the Young Artists week. A ghost story, the opera tells the story of three men who are stuck in in a remote outpost on the Outer Hebrides, with the psychological pressure rising. ‘It’s a terrific piece of theatre’, says Samuel. ‘The music is unsettling because the piece unsettles. If you feel awful by the end of it then we’ve done a great job’. And as for the future – after plumbing the depths of opera’s dark side, do the comparatively squeaky-clean roles of a tenor’s core repertory such as Rodolfo or Alfredo still appeal? The Jette Parker Young Artists Summer Performance takes place on 17 July 2016. Tickets are still available. Both the Jette Parker Young Artists Programme and Meet the Young Artists Week are generously supported by Oak Foundation. Find out more about the Programme. I am commenting for your Mother and I as we are so proud of you.All the very best with all your performances. Keep it up.hope to catch base one day. He is promising fresh blood talented Australian tenor, obviously he was courageous enough to move further to pursue his future career to conquer the opera world. Samuel Sakker was greatly supported by many ppl in the opera circle scene, in particular our leading Australian soprano Emma Matthews who was shown enthusiasm for his breakthrough to the world, I presume it's wonderful news to her , the Australian opera lovers and hopefully to the opera world .